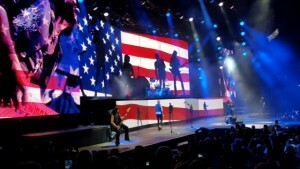 This weekend, I was very fortunate to see two of my all time favorite bands, the Scorpions and Queensryche. I was also lucky enough to be a guest of Eddie Jackson of Queensryche. I would like to thank my cousin’s husband, who had coached Eddie’s son in soccer, for making this happen. Before heading to the show, we grabbed a few beers at the hotel. We were waiting for Eddie to call us with instuctions on where to meet him at the arena. When he did, we were told he would meet us by the tour buses. As we arrived, Scorpions drummer, James Kottak, was just getting off their bus to go into the arena. He happily greeted a handful of eager fans looking for autographs. I jumped right in and handed him my CD sleeve from their new album Return To Forever. After he left, we were directed to the doors where we would meet Eddie. As we approached, he came out and greeted us with a big smile and handshake. He brought us into their dressing room where Michael Wilton was on his laptop as Eddie introduced us. He then gave us a tour of the stage where we ran into Mathias Jabs, who took a quick minute to sign Love At First Sting for me. Eddie then said his goodbyes because he had to be on stage in twenty minutes. Waiting for the show to start, we grabbed a few beers and made our way to our seats just in time for Queensryche to hit the stage. The lights went out and the three quarters full area erupted with cheers. They hit the stage playing “Anarchy-X” leading into “The Needle Lies” off of the classic album Operation: Mindcrime. 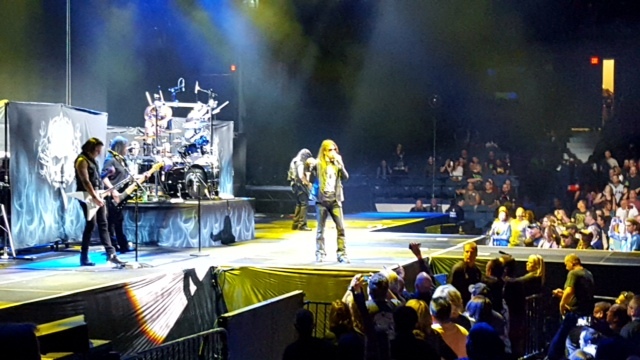 The band sounded as good as ever and Todd LaTorre’s vocals did not disappoint. Wilton and Parker Lundgren make a great guitar tag team while Jackson and Scott Rockenfield held it all together. As they only had forty-five minutes on stage, they stuck to classics off of their first four albums along with “Arrow of Time” off of their soon to be released Condition Hüman album. My favorites of the night were “Walk in the Shadows,” “Empire” and the last song of their set, the song that started it all, “Queen of the Reich.” Hearing LaTorre’s vocals during that closing song assured me that the band made the right choice for Geoff Tate‘s replacement. Before the Scorpions came out to play, my expectations were quite low. The last time I saw them was 2003. They had sound problems and their stage show was boarder line cheesy, especially the lit up cloth flames that were being blown with fans for movement. At last, they came roaring out to a near full arena playing “Going Out With A Bang” the first track off of their new album Return To Forever. They did not disappoint this time around with what seemed like floor to ceiling LCD screens with everything from speakers, explosion, album covers and of course themselves, larger than life. Next up were the classics “Make it Real” and “The Zoo.” Klaus Meine sounded youthful and the backbone of the band, bassist Pawel Maciwoda and drummer James Kottak were spot on. At that time we got a text from Eddie to come backstage and meet the band. After introductions, a few pictures, autographs, beer and a tour of their bus, Eddie decided to join us in our seats to watch the rest of the Scorpions‘ set. Even though I missed half of their set, I was completely satisfied with everything they played. And one last note, if a band ever disappoints you, give them another chance. 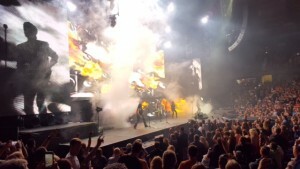 The Scorpions reaffirmed me that they are still one of the greatest live bands of all time.